Krytac Owners Give An Idea Of How Cool You Can Build/Setup Your Krytac!!! haha thanks, that scope is now on my VSR and although I utterly love the DMR I actually prefer the PDW which although was modded is now in standard form as the Prommy barrel pushed it over 350fps (standard is roughly 345fps) I have a Silverback SRS 16" barrel end cap to negate the need for a flash hider and it shoots so nice. I am tempted to try the 30k motor in it as I mainly run a 7.4v LiPo so the double feed issues folk have complained about (which I have never suffered) shouldn't be an issue, I can get an 11.1v in the stock but it is so tight a fit it is an arse to bother with. When running the PDW as a primary I normally fit a magnified scope as it is plenty good enough to warrant it but when using it as a sniper secondary I run it as above. I prefer the PDW I bought a CRB and regretted it straight away, not that I had it long RIP. If it wasn't for the fact that I find the Ar15 platform boring I would be tempted by the PDW when I next get a new gun. The 30k does run well with a 7.4v but if you really want a good motor. 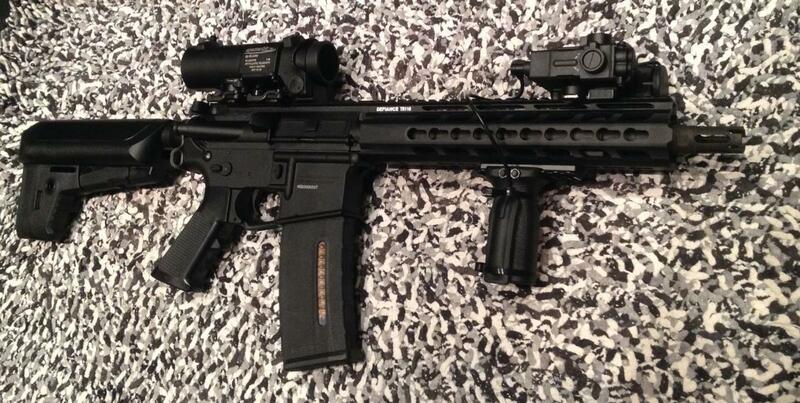 The (at least my) PDW is the bestest best out the box AEG I have EVER owned no lies. I have concerns now they have built a solid rep that their new range of guns will be well below par WRT the costs. I would not expect their non-Trident range to be anywhere near as good as the Mk1 Tridents and possibly the Mk2 Tridents may be less good too.... but I only say that as I am a cynic not because I know anything so don't take my word on that. I actually wish I had bought the SDP when it was a proper Krytac, it now falls under the lower spec guns so may not be anywhere as good as the original Tridents. Struggle to even use with a high c 7.4v lipo. I have one and can only use a 9.6v nimh. Pulls a 150 spring like its a rubber band. I think the MK2 will be a step up from what I have read. Wont get one though as Krytac have pissed me off a bit by seeming to not care enough about the UK market. I would up until recently have agreed except I have spent several evenings chatting on Farcebook with a Krytac person who is also ex KWA chatting about marketing etc. They are selling every gun they put on a shelf in the UK so our lack of marketing as we see it is their version of not creating more demand than they can keep up with. Also with the KWA RM4 spares issues learnt they are ensuring that they do have the spares for each Krytac sold. I was miffed to have had a 20k motor in my guns but that was due to UK retailers mis marketing them not Krytac. BTW I am in no way at all associated with Krytac, I just like a good product when I see it. Nothing terribly revolutionary, I just swapped out the grip and threw on a few carefully chosen accessories. Nice gun but the scope looks a bit small have you tried an aimpoint M2 for the aesthetics? While I am sure you are very proud and I feel terrible saying it but I have to be honest you have uggoed it. Step back and look again. It just doesn't work, nice parts but not together. Hi and welcome to AFUK is what he means..... rather than voicing an opinion on something he has not spent money on and doesn't have to use. Yeah definitely welcome but it is a thread about showcasing your Krytac set ups. I wasn't being harsh just honest and I think its mainly the scope doesn't go and would look so much better with an aimpoint. If you stick your artwork in a gallery expect critics. Nice gun but the scope looks a bit small have you tried an aimpoint for the aesthetics? Sorry to have to tell you, but the RDS is a clone of the Aimpoint T1. I use this particular optic precisely because of its small size.